My house is at the corner of Chief Lake and Mountainview Roads. It is easy to find as it is a log house and is the only house visible at this corner. Drive north on Foothills until it ends at Chief Lake Road, turn left on Chief Lake and drive 3.5 miles West to Mountainview. Mountainview is the first right after the street lights end at Pilot Mountain Road. Mountainview is two miles west of Pilot Mountain Road and the little white street sign shows up in your headlights for almost a mile before you get there. You can’t miss it! If you subscribe to Sky and Telescope magazine through the PGAS, you save 18% on your subscription. To subscribe, give Alan Whitman a money order for $29.96 (US) by December 18. We must have a minimum of five people to take advantage of this offer. This entry was posted in 1993, Newsletters on December 17, 1993 by glen_h. It is that time of the year again when you are asked to make a small contribution to show your continued support for the club by paying your membership dues. I was out at the observatory today to collect the images for this issue’s Image Gallery. Bob Nelson was there (with a handful of volunteers) putting up the interior walls of the classroom. Bob could probably use a lot of help. My cats are bringing several mice into the house on warm days. Sometimes they are alive and a great commotion ensues as I chase the tiny beast around the house with an empty ice cream bucket and knocking over plant pots. Sometimes I find a motionless corpse on the carpet in various stages of digestion. How do you react to a slimy, grey ball of fur and intestines about as big as a human thumb lying very close to your bare foot and a voice in your mind saying, “You could have stepped on that, you know.” My kids think that its ‘cool’. They burst out the front door and call to their friends, “Hey! Want to see a puked up mouse?” Thank goodness winter is almost here. Hi, folks! This will be my last message as president, as I have decided to step down, as of October’s meeting when the annual elections are held. It seems appropriate that I should reminisce a little about where the society has come from and offer a few thoughts about its future. The concept of building an observatory originated in a discussion with the students in my introductory astronomy class at CNC in February of 1979. We immediately established ourselves as a registered society and applied for a grant from the B.C. Lotteries Foundation; we were awarded a sum of $12,600 in August of the that year. (Grants of $1500 and $3500 followed later.) In December of 1979 we purchased a used silo dome in Vancouver, hauled it to Prince George, reconditioned the panels that spring, and reassembled it outside in May. The physics technician at that time, Ed Loerke and a summer student, Bob Sedlock fabricated a base ring, adapted wheels to rotate the dome, cut the 5′ wide slot, attached arches, made the shutters and added mechanisms to open the shutters. Construction of the building began in the summer of 1980. We cleaned up the bedrock at the site and laid a circular concrete foundation and a square pad for the pier. We hired a bricklayer to build the circular building and at the same time installed the joists ourselves for the second floor. (Almost all lumber was donated.) The dome was installed that November, although it was not until the next year that we were able to make it operational. A heavy fibreglass tube, 30 inches in diameter and 10 feet long together with a “cage” of rebar welded together was then installed to serve as the form for the concrete pier. In the next three years, working with small groups on available weekends, we constructed a helical stairway, put in the upper and lower floors, poured the pier, added outside steps, framed the warm room, painted the building and finished the interior generally. The wiring was installed in the fall of 1984 by a class from the electrical program at the College. Construction of the telescope lagged somewhat behind that of the building. Although the telescope “tube” was constructed in 1980, it was not until 1982 that construction of the mount began in earnest at the millwright shop at CNC. The telescope was completed in the spring of 1984 (the welding students did all the welding and I did about 75% of the machining) at which time the mirrors arrived. Installation up on Tabor Mountain occurred shortly later. Highlights of the telescope’s earlier life on Tabor Mountain include a cold winter day in January of 1986 when we had around 75 people to look at Halley’s comet; a measurement of a minimum light of VW Cephei (an eclipsing binary) using my OPTEC SSP-3 photometer; astrophotography of the moon, planets and deep sky objects plus the usual observing. Unfortunately, the Tabor Mountain Observatory was plagued by break-ins. The latest and most serious was in 1988 when the secondary mirror (and other things) were stolen. We closed the observatory at that time, removing all items of value. In 1991, the decision was made to relocate the observatory to its present location on Tedford Road. We got our existing B.C. Lotteries grant switched to this goal and held a couple of casino events to raise money. Northwood kicked in $1000. In late June of 1992, we broke ground for the observatory on Tedford Road and in July, put in the foundation and block walls. After the summer we put on the roof, moved the telescope and dome, and closed up the building. Over the winter, we put in the main floor and rough finished the interior. In the spring, we received a $16,000 grant from the Science Council to add a classroom wing. Construction began in May (Ted Biech and I worked full-time and were assisted by numerous volunteers) and we were able to close up the building by the end of July. The telescope and observing floor were also completed by about this time. Also in the spring, we received a $25,000 grant from the Ministry of Higher Education to put on the PeGASus project. As you know, this involved the ordering of much equipment (which the society will own) and the hiring of students to put on tours throughout the summer. The tours for the PeGASus project started August 1 and continued through September; many new members joined and the observatory has become very popular. There were many clear nights throughout September and the observatory was used for many or most of those nights. Much credit goes to Ted for obtaining the grant (some of us were not too optimistic), ordering the equipment and giving up his summer to see that the tours went well. Although the site on Tabor Mountain is more spectacular than the present one, everyone will agree that the move to Tedford Road was a vital one for the success of the observatory. The advantages are numerous. Unlike the former site, we now have power and telephone; we have neighbours that can keep an eye on the place; we have not had a hint of vandalism so far; the site is much more accessible (only 20 minutes from town on mostly paved roads); and the sky quality is virtually identical with the former site. With the completion of the classroom wing (heating and washrooms), we’ll have a fine facility usable year-round. In the 13 years since its formation, the society has grown from a struggling 15 members to the present 40-50. The membership has become more active with good attendance at monthly meetings, there has been much enthusiasm for observing (Orla’s beginners’ observing group is an excellent idea), and many new directions have opened up now that we have more members. In fact, there are so many jobs that the executive last month presented a proposed reorganization of the society’s positions. (See the summary elsewhere in this issue.) The society’s future indeed looks bright. In closing, may I express my gratitude for the steadfast support of the various executives over the years and the many club volunteers too numerous to name up who worked on Tabor, at casinos and on Tedford Road. Thanks also to personnel at various departments at the College without whom the observatory could not have been built. And finally, thanks are due to our many corporate sponsors over the years (who will be publicly thanked when the observatory officially opens next spring). We were all working for the betterment of astronomy in Prince George and it is a real pleasure to see it all coming together. I’ll still be around, but we will have a new president to lead us on. Thanks again to you all. 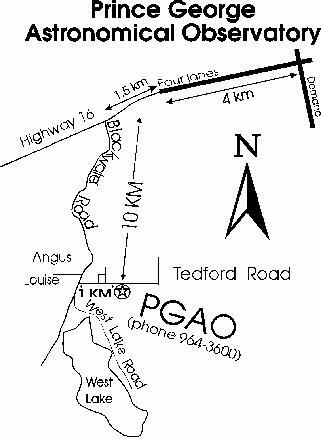 In 1979 Bob Nelson founded The Prince George Astronomical Society (PGAS) and began building an observatory on Tabor Mountain. Bob completed the task five years later with help from a handful of volunteers and CNC’s machine shop. After its completion, the club operated the observatory for a number of years, providing an exceptional view of the sky to school groups, the general public, and club members. In 1988, the observatory was abandoned. My understanding of the events leading to the closure of the Tabor Mountain site is unclear; however, the retreat from Tabor Mountain had something to do with the dome being used for target practice, and the desire for some thief to possess a mirror that reflected the true size of his (or her) head. Shannon and I moved to Prince George at the close of 1991 and I started work at the College in January of 1992, and Bob saw to it that I was introduced to the PGAS posthaste. During my first summer here, Bob (and a handful of volunteers) began construction on a new observatory near West Lake, and by November the telescope and the dome from Tabor Mountain were installed in the new building. On Tabor Mountain, there remains the old observatory walls: an empty concrete shell punctuated by the central pier. Soon, only the pier will remain. During the spring and summer of 1993, change again sprang upon the PGAS with the successful application for funds from two sources: the Ministry of Advanced Education, Training and Technology ($25,000) and the Northern Interior Science, Technology and Innovation Council, NISTIC ($16,000). A flurry of activity within the club ensued, and my summer was swallowed up by a horse. Shannon called the horse PeGASus. Actually, it was all Ted Biech’s fault. Ted wrote the proposal to the Ministry of Advanced Education, Training and Technology because his workload at the College was not challenging enough. I clearly remember him complaining to me one Friday in early October of 1992 that his summers were idle because of too much grey time and vacation time allotted to the CNC instructors. “Ted, I want to paint my house this summer”, I insisted, when he showed me the proposal and where to co-sign. When I signed, I crossed my fingers and hoped that the proposal would get lost in the mail. It didn’t. The PeGASus Project began in mid March. From March to June, I visited about twenty elementary school classrooms to talk to students and teachers about astronomy and telescopes. On May 1, we celebrated Astronomy Day at the Fraser-Fort George Regional Museum; surprisingly, nearly one hundred people joined us for the evening despite the rain. When so many people came to take part in astronomy during the rain, I knew that the citizens of Prince George were desperate for astronomy. The time was ripe for PeGASus. This was confirmed later in the summer when, about one hundred people came to the newly open observatory to view the Perseid Meteor Shower despite the thick cloud cover. “Wouldn’t it be great if we had some club T-shirts? Lets get Shannon to make some! She’d love doing that. And how about some PeGASus business cards … and some PeGASus posters … and a PeGASus donation jar … and?” While Shannon was busy, we created the PeGASus booth and adorned it with astronomy posters and post cards, PeGASus T-shirts, mirrors and lenses, telescopes, pamphlets, newsletters, astronomy magazines and our official PeGASus donation jar. The booth was a wonder to behold (I wish I had taken a picture). On Canada Day and the International Food Festival at Fort George Park, over a thousand people visited our display and looked at the Sun through our solar filter. Meanwhile, back at the observatory, construction was under way to attach a classroom to the existing observatory building. The money to do this came from NISTIC through the second grant application written by Bob Nelson. Bob and Ted (and a handful of volunteers) worked (harmoniously, I hear) through the summer rains (hip deep in mud up to their necks, and fighting refugee mutant mosquitos from Manitoba) in order to complete the classroom before the end of June in time for Canada Day. They almost made it! It was so close! But, the slow motion camera captured the final frames: the rain came and the roofers didn’t. next to them. Little fingers groped at the eyepiece of the telescope standing majestically behind the booth. Curious eyes peered through the telescope at price tags in Sears at the other end of the mall. People asked us questions and we answered. Features of the planets and moons of the solar system are named according to conventions set by the International Astronomical Union (IAU). At the last monthly meeting, the executive proposed the following organizational structure of the PGAS. In general, this structure seemed to be acceptable to the members present at the meeting. If you have any suggestions, please present them at the October meeting. At that time a motion will be put on the floor to adopt this structure. PRESIDENT: Plans and chairs meetings, deals with executive, sees that the committees function and tasks are done. VICE PRESIDENT: Assists the president, chairs meetings in the president’s absence. SECRETARY: Keeps notes from meetings, maintains membership lists, deals with members, files society’s reports. TREASURER: Maintains bank accounts, handles money, pays bills, does income tax, issues financial statements. PROMOTIONAL DIRECTOR: Oversees the promotional aspects of the club. The promotional aspects of the club includes such things as meeting or other event notices, the newsletter, new or prospective members, casino events (deals with Public Gaming Branch, rounds up volunteers), and social events. TECHNICAL DIRECTOR: Ensures that the equipment and facilities at the observatory are maintained. The technical aspects include such things as building and ordering of new equipment, construction of classroom , maintenance of existing equipment. The earth’s outer shadow is called the penumbral shadow. As the moon moves into the penumbral shadow, the moon experiences a partial eclipse of the sun due to the earth covering part of the sun as seen from the moon. As the moon moves deeper into the penumbral shadow, the sun is progressively covered by the earth so that the moon is illuminated less and less. Then the moon moves into the earth’s umbral shadow which is much darker but not black, due to refraction of sunlight by the earth’s atmosphere which bends some sunlight into the shadow. The earth’s umbral shadow is darker at it’s centre than at the edges and may show quite a range of colours. The moon’s north polar regions should be the darkest at mid- eclipse as the south polar regions will be just inside the southern edge of the umbral shadow. Watch the constantly changing colours and shading as the moon moves through the shadows. The moon will be between two large, bright open star clusters, the Hyades and the Pleiades, affording an excellent photo opportunity. People tend to assume that cloudy skies in their backyards are representative of conditions everywhere. This is not necessarily the case, especially if the clouds are low clouds, which often cover only a few square miles. Matthew Burke wrote an article a few months ago describing his successful pursuit of a break in the clouds to view the May 21st partial solar eclipse. I viewed the January/92 partial solar eclipse with nearly clear skies at my Chief Lake Road residence, but both this newsletter and the Citizen reported that Prince George was clouded out, when in reality, only the “bowl” was. So, don’t be too quick to assume that this eclipse is clouded out if it’s cloudy the first time you look. The “bowl” has more fog and low cloud problems than surrounding areas because of the mix of moisture from the pulpmills and smoke particles from the beehive burners for the moisture to condense on and form fog and clouds. A drive of a few miles may reveal much clearer skies. Since this will be the best lunar eclipse in years, a little extra effort to see it should be worthwhile. If you elect to stay at home, check the sky every ten minutes or so during the eclipse and you may be rewarded with clearing skies or at least a strategically placed break. Finally, the partially eclipsed moon is often visible through clouds. Your unaided eye will give you a fine view of the eclipse. Binoculars and low-power telescopes give the best view of the complex combinations of colour and shading in the shadow. If you use a larger telescope, use the lowest available power. In my experience, binoculars will give a much more esthetically pleasing view of a lunar eclipse than, say, a Celestron 8. Saturn is south at sunset and sets around midnight. Venus and Jupiter form an attractive pair during morning twilight, very low in the SE. At dawn on Nov. 8, Venus passes only 0.4 degrees N of Jupiter. Binoculars may also show Spica, about 8 degrees upper right of Jupiter. The waning crescent moon passes the pair on the 12th, but it will be only 31 hours before new and may require binoculars to see. Binoculars will probably be needed to pick out Mercury as it passes 0.7 degrees N of Venus on the morning of the 14th. Nevertheless, it will be a golden opportunity to identify Mercury, especially if you’ve never seen it before. These events will occur during bright morning twilight and will require a low SE horizon to be seen at all. However, they may be attractive enough to warrant a short drive to a flatter horizon. Bring your binoculars and plan to start viewing about 6:40am. If adjacent Venus allows you to find Mercury in a good telescope, follow it carefully as it rises higher after sunrise to an altitude affording decent seeing. You should be rewarded with a view of Mercury’s crescent, only about 24% illuminated on the 14th. Rise a little earlier on the 17th and you can watch the Leonid meteor shower. The Leonids will probably only produce about 10 to 15 meteors an hour. i once saw two bright jade green Leonid fireballs follow the same path a few minutes apart. Both left ionized trails in the upper atmosphere; the second train lasted many minutes in binoculars as it twisted in high altitude winds. Next Meeting: The October 27th meeting will start at 7:30 P.M. at the College of New Caledonia. Come to the Physics Laboratory on the second floor by the main entrance. The room number is 2-223. It is time to pay your annual dues: $10 youth, $20 regular, and $30 family. If you are a new member who paid your dues during the summer, please ignore this notice. If you cannot make it to this meeting, please send us your money along with the application form elsewhere in this issue. Nominations close just before the elections at the next meeting so there is still time for you to nominate someone. Come to the meeting and practice for the upcoming federal election! While the ballots are being counted, Brian Potts will tell us about the basics of astrophotography, and Vince Hogan will give us an impromptu talk on binocular astronomy. Coffee/tea, cookies and discussions will follow. The last meeting was held at CNC. The business part of the meeting lasted for about 1 hour (sorry) wherein the progress at the observatory was described and people’s arms were twisted into voluntary service. The only names I have here is Rod Marynovich (who volunteered to look into obtaining a fire permit for the PGAO so we could burn our garbage). Several members volunteered to help out with construction at the observatory and to help keep our facility open to the public on a couple of Saturdays every month. Using star charts, and star hopping. These four topics were covered in four successive Monday evenings (excluding Thanksgiving). The and then to cycle through them again on another evening of the week, and-so-on throughout the year. Because the lessons are very informal, it is doubtful that any one series of four workshops will be the same as the previous, so members can attend the workshops as many times as they wish and get something new out of them each time. The first series of workshops are being held on Monday evenings from 8 to 9 P.M. at the observatory, starting September 20 with an introduction of what is in the sky and naked eye astronomy. The second workshop, using star charts and star hopping, will run on September 27, and-so-on. Feel free to join the workshops at any time, and to participate for as many sessions as you wish. We hope that as NOA matures, the topics will change to suit the needs of the PGAS participants. In the next issue, I hope to keep you informed of the progress of NOA and the scheduling of the next set of workshops. If you have any suggestions or questions give me a call at 964-9626. One final note. Please do not expect formal, prepared lessons in these workshops. The idea of the workshop setting is for all the participants to get involved learning some basic observational techniques. Vince and I will hopefully be able to gather the necessary materials to make the workshop successful and fun. If not, then we’ll do better next time around. This entry was posted in 1993, Newsletters on October 17, 1993 by glen_h. Is Wednesday evening the best time to hold our monthly meetings? The question arose at the Editor’s Office when in walked a beautiful woman with long flowing red hair. “I want a job at the Editor’s Office “, she said. The expression on her face told me she was serious. I knew that look from somewhere. But where? I thought long and hard. Then it came to me. The women was my wife, Shannon. Now Shannon assembles the newsletter. She designed the current format, corrects all of my spelling and grammar error, and she thought up the word PeGASus as the name for the newsletter. Shannon suggested that Friday is better if we are to have youth participation because Friday is not a school night. At Astronomy Day, a few participants indicated that it would be easier for them to attend meetings on Friday evenings because it is difficult to get away from home on a school night (even for adults). So, I would like to ask for your input. Come to the next meeting to voice your opinion or give me a call at the Editor’s Office (964-9626). By the way, as you read this issue of the newsletter, you may notice that Shannon is not here to correct spelling and grammar errors. Hurry back, Shannon! Cosmology is the study of the large-scale structure and evolution of the universe. Cosmogony is the study of the origin of celestial structures such as stars, clusters, galaxies and clusters of galaxies. There have been many attempts to create a comprehensive theory which encompasses cosmology and cosmogony. The current theory of favour is the so-called “Big Bang” Theory. The Big Bang Theory has been able to broadly outline the evolution of the universe, but many vexing problems remain with this theory i.e. the structure, origin, and sizes of the galaxies. The Big Bang Theory should not be thought of as the final theory of the universe but rather as another approximation to the observations which we make of the universe. A good understanding of cosmology is rooted in a clear understanding of the basic principles which are ASSUMED at the beginning of any theory. The first key principle is the COPERNICAN COSMOLOGICAL PRINCIPLE. This principle states that we do not observe the universe from a privileged viewpoint i.e. the earth does not occupy a special place in the universe. This principle is named after Nicolas Copernicus who, in 1543, proposed that the earth might not be at the centre of the universe, a heretical view-point for that time. By viewing deep-space photos of galaxies and counting their spatial distribution in different directions, we see that on the largest distance scales, the Copernican Cosmological Principle is approximately valid. An attempt to extend the Copernican cosmological principle to hold for time, i.e. that the universe appears to be unchanging, called the Perfect Cosmological Principle, has been shown by observation not to hold. The Prefect Cosmological Principle was the basis of the “Steady State” class of cosmological theories. These theories were proposed by H. Bondi, T.Gold, and F Hoyle in 1948. For about 17 years, this theory was a competing theory against the Big Bang Theory. In fact, the term “Big Bang” was invented to denigrate this competitor to the Steady State Theory. To be continued . First Step: Imagining the Earth: The universe as we have come to know it in the last hundred years is a big place. We are told that it is hard to imagine how large, and if we try to imagine the immensity of it then we will feel very small, insignificant, and humble. Well perhaps this is true. It is true that the universe is immense in comparison with our everyday experience. Everyday experience involves looking at the fine print on the national referendums, wandering around the house picking up after the kids, working in the yard, walking to the corner store, or driving to the mall. On rare occasions we may venture out on our treacherous B.C. highways and travel south to Vancouver. So our everyday experiences range from dust to the distance to Vancouver. The range of distances involved in our everyday experience start at a fraction of a millimetre (perhaps one-tenth of a millimetre) to 1000 kilometres. There are 10,000,000,000 (10 billion) one-tenth millimetres in 1000 kilometres. That is, if you lined up 10 billion dust particles, each one-tenth of a millimetre in diameter, then they would reach from here to Vancouver. This is the range or our everyday experience. Our brain can comprehend 10 billion. But can we comprehend 10 billion 10 billions? In order to get an appreciation for the size of the universe, a good approach is to try to scale it down to something that we can comprehend: like a comparison between a grain of dust 0.1 mm across to the distance to Vancouver. You could, for example, imagine that you are the size of a grain of dust and ask yourself how large the earth would be on that scale. If you are 6 feet tall (1.8 metres) and you wish to scale yourself down to a grain of dust, then the size of the earth can be found by simple ratios if we know the actual diameter of the earth in metres, which we do. It is about 12,756,000 metres. So, scaling that down to our new dust sized beings, the earth is about 710000 mm in diameter. This is about 7 kilometres. Hence, we arrive at the following point of view: we are but particles of dust moving about the surface of a giant ball which is 7 kilometres in diameter. Seven kilometres? That’s about the diameter of the bowl in which Prince George sits. Take a look at a speck of dust in your house and imagine it to be you. Then try to imagine your tiny dust-body attempting to walk from downtown Prince George to the growing UNBC campus on Cranbrook Hill. If you managed to walk that distance you would have walked about one third the distance around the 7 kilometre diameter world — as you know the world is not flat. There are, in fact, just over three diameters in one circumference. Looks pretty far to walk when you are the size of a grain of dust. Just what kind of progress could you make in a day. Lets say that you can walk your own body length every second. So in 10 seconds you can walk 1 millimetre; in 100 seconds you can walk 1 centimetre. You can walk one whole metre in about three hours allowing for a 15 minute break. So in one whole 9 hour day of walking you can cover three metres. It would take you a few days just to get out of your full scale house. As you can see, the world is a big place compared to the size of your body. But what about the rest of the universe? The earth’s nearest neighbour is the moon. The moon is actually 384,404 kilometres away from the earth; that’s just over 30 earth diameter. So, if you are a speck of dust and the earth is a 7 km ball resting in the P.G. bowel the moon is a 2 kilometre diameter ball near Williams Lake, south of Prince George, about 200 kilometres away. Can you imagine being the size of a speck of dust living on a 7 km ball and being asked to travel to a moon which is 200 kilometres away? Humans have done just that. But the moon is just our nearest neighbour. What about the rest to the solar system? We have taken the first step. In order to explore the rest of the solar system, we have to take another step. To be continued in a later issue . This was our fourth casino event and was held over two days (instead of three) for the first time (it included a week-end evening). We raised $2517 on the Thursday and $1000 on the Friday for a total of $3517 (this was up from $2800 earned last time). All told, the executive is quite pleased with this amount. Thanks go out to Ted Biech, Gerhard Bierman, Jon and Peter Bowen, Don Goldie, Rod and Steve Marynovich, Alan Pretty and Larry Steel (your reporter also served). Quite accidentally, I learned that, contrary to the rule a few years back, we are not restricted to one casino event a year. All we have to do is submit the report and request a new date (there is a waiting time of from four to six months). We could therefore have up to three events a year, earning somewhere in the neighbourhood of a cool $7,000 – 10,000. Judging from the opinions of those who staffed this event, we are not close to volunteer burnout yet; however, we shall have to be careful on this score. As our club gets bigger, though, we will be able to share the load more (even this time, there were some members who did not have to be called upon). A worrisome trend in the classroom addition is the tendency to go over budget as there are things we did not think of and higher costs than expected. The nice things about more casino events is that now there can be no doubt that we will be able to pay for the new building and whatever new equipment we need. The next meeting of the PGAS will be on Wednesday May 26 at 7:30 P.M. at the College of New Caledonia in room 2-223. At this meeting, the time of the summer meetings will be discussed (as suggested by the Editor). Bob Nelson will describe the most recent progress at the PGAO, and Orla Aaquist will summarize the events of the May 21 partial eclipse of the Sun. Also, some new hardware made available through the PeGASus project may be on display. The feature presentation for the evening is entitled, ‘Three Times in the Moon’s Shadow, Making Your Own Good Luck’. In this talk, Alan Whitman (PGAS member) will look back at three total solar eclipses and forward to the eclipses scheduled in the next decade. At the last meeting on April 28, we saw several new faces. The PGAS executive and regular membership would like to take this opportunity to welcome you and invite you to attend the upcoming meeting. Bob gave an update on the latest developments at the observatory and classroom addition. Volunteers for the casino event were asked for. Orla summarized the current PeGASus Project activities and the scheduled events for the Astronomy Day (night) activities at the Fraser-Fort George Regional Museum. After tea and coffee, Bob Nelson illustrated the simulation software ‘Dance of the Planets’. On morning of June 4 there will be a Lunar eclipse. Prince George residence will be able to catch the initial stages of this event as the moon enters the penumbra (the outer part of the Earth’s shadow). Shortly afterwards the moon sets. Most of June is a good time to view Mercury in the early evening sky. It appears farthest from the Sun on June 17 (greatest elongation) and will shine with a magnitude of 0.6. Venus shines bright at -4.5 magnitude in the predawn sky. It will continue to dominate the sky for the remainder of the spring and most of the summer. Venus reaches greatest elongation on June 10. Mars is quite dim in the western twilight after sunset and is easily overlooked. It sets about four hour after the Sun. You will have to stay up past midnight if you want to have a look at the ringed planet, Saturn. By morning, it is visible in the southeast. Jupiter shines at magnitude -2.1 among the relatively fainter stars of Virgo. Jupiter will be visible all summer. On June 27 the giant planet is at quadrature (it lies 90 degrees east of the Sun). Near the time of quadrature, you can see Jupiter’s phase more easily than at any other position in its orbit. Even though Jupiter appears 99 percent lit, the eastern limb supposedly does look less defined than the western limb. Watch for eclipses of the Galilean satellites in June because the eclipses occur farther from the planets disk than at any other time. In particular, on the night of June 8, Ganymede vanishes behind Jupiter’s western limb at 16:57 PDT and reappears from behind the eastern limb at 19:51 PDT. Unfortunately, the Sun is still up at this time. However, at 21:57 Ganymede will disappear again while well away from Jupiter’s disk. It then magically reappears again 39 minutes past midnight. Can you explain why Ganymede can be eclipsed twice in such short succession? If you have any questions about the night sky, I will be happy to look into my crystal ball. Give me a call (562-2131 local 307). Well, a lot has happened. Jim Livingstone has come up with a nice set of plans for the classroom addition in consultation with John Morgan, (a professional engineer at CNC who can approve our drawings). Thanks Jim and John. Brute Drilling and Contracting excavated on May 11, the forms for the footings were completed on May 14, and at time of writing, the footings were supposed to have been poured on May 17. By the time you read this, the foundations should have been added as well and perhaps the brickwork started. As Ted Biech and I are committed to working full time on this thing, we should be able to get the basic shell up by the end of the month. Also on May 17, the insulation and drywall in the warm room should have been installed and the CNC electrical class should have completed the wiring in the original building (no more extension cords!). The donations have started to come in. I’m pleased to announce that the Pas Lumber Company has generously donated 105 pieces of 2″x10″x10′ lumber and Northwood has generously donated 50 sheets of 5/8″ T&G plywood for the floors. Donations greatly reduce costs and make all this possible. On another front, I attended a meeting of the West Lake Community Association where the item of interest was the possibility of natural gas coming to the area. Although it’s not certain to proceed, the majority of the 50 or so people were in favour and it appears probable that natural gas will be provided next summer. (In case you’re not aware, heating costs with natural gas are about 1/3 of those with propane.) Although I did not speak at the meeting, I did talk with several people at the break. Interest is high in our project and a note will appear in their next newsletter. I believe we can count on the support of the people in the area (which is important for our security and other things). We need good neighbours! On May 1, the Prince George Astronomical Society (PGAS) and the Fraser-Fort George Regional Museum hosted an evening of star gazing in celebration of the 20th anniversary of Astronomy Day. Although there were very few stars at which to gaze (it rained), the evening was a tremendous success. It was an educational experience for all who attend, and the few who remained until 10:45 even got a glimpse of the moon and Jupiter through Bob Nelson’s 33 cm Dobsonian. I was pleasantly surprised by the influx of people. Because of the heavy cloud cover and rain, I had anticipated a turnout of only a handful of people. However, Cindy Rebman (the museum’s program coordinator) estimated that about 90 people passed through the museum. This shows that there is a considerable public interest in astronomy in Prince George. Thanks to all members who came down to help make the evening a great success, especially Bob Nelson who brought his big eye, Ted Biech who brought his computer and simulation programs, and Alan Whitman who brought his video of the 1991 solar eclipse. I also got a glimpse of Jon Bowen actively sidestepping through the crowds. I had anticipated performing last minute organizational activities after the museum doors opened, however I was swept away into the conference room at 8:15 to give my presentation and I did not emerge before 10:30. This left many of the members to their own devices. Thanks for surviving the evening on your own. Next year we hope to be better organized. Astronomy day will be held on April 16 (1994). The moon will be 6 days old, so craters will be easily seen. Of the planets, only Venus and Jupiter will be visible. Venus will be close to the horizon just after sunset and very small at 11 seconds of arc. Venus will set just as Jupiter rises at about 9:30 p.m. Perhaps we could have a day long display at the museum, with solar viewing during the day and ending with a star party in the evening. By next year, the PGAS will have more show and tell items from the PeGASus Project and hopeful a larger membership. This entry was posted in 1993, Newsletters on May 17, 1993 by glen_h. 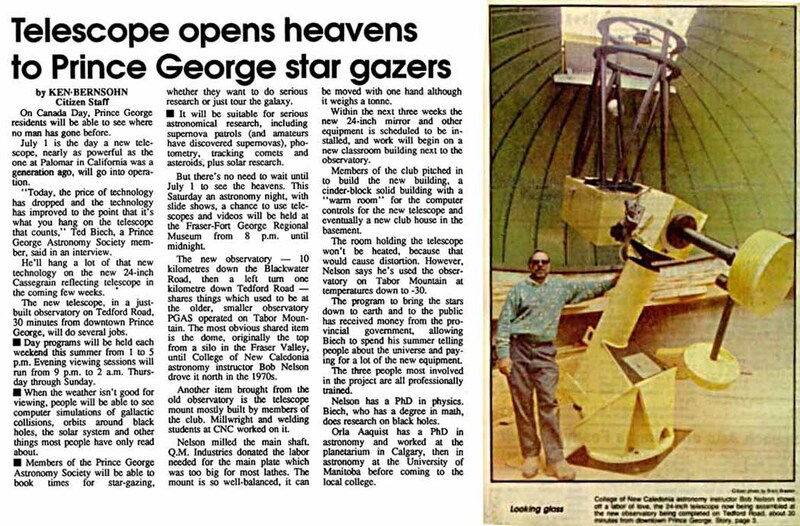 Overview: Article discussing the opening of the new observatory on Tedford Road. A photo of Bob Nelson and the newly fitted telescope. This entry was posted in 1993, Newspaper Articles on April 27, 1993 by glen_h. Over the last few weeks, the PGAS has been approached by several individuals interested in astronomy and our society. This correlates directly to our recent flurry of activity and our increased public visibility. For example, our information booth at the Regional Science Fair drew the attention of many of the students and teachers who dropped by to have a look through the telescope and play with Ted’s galaxy collision simulation, and our school presentations are in increasing demand and will likely result in the need for a youth membership. Astronomy day is rapidly approaching and will give us an opportunity to attract more members. Hello, everyone!! Well, we have both cheques in our possession (a bird in the hand … ?). I refer, of course, to the $14,400 from the B.C. Science Council for the classroom addition (the remaining $1600 will be awarded on completion) and the $25,000 from the Ministry of Higher Education for the PeGASus project (equipment plus student help for the extravaganza to take place this summer). It’s gratifying to have the money at last. Now we have to make it all work. In a nutshell, things are looking good but there are a few headaches and concerns. The boxes for light outlets, switches and convenience outlets have been installed and await the wiring. Supplies have been purchased and the College class is scheduled to install the wiring in the first week in May. Insulation and drywalling are next. The next thing we need is a local burglar alarm. Lance and Mary are working on this and should come up with something soon. Thanks to Vince Hogan, the scrub bushes and trees are being cleared to give the neighbours a clear view of the building and hence give us better security. Once the security has been upgraded, we will be able to install the mirrors and do the necessary optical alignment (and therefore be back in business!). The dome needs work; this is occurring slowly. Soon we will be able to rotate the dome all the way around with confidence. We have to fix the 4 bullet holes, do some additional servicing and paint it. Other work remains to be done on the original observatory building; however, it is proceeding well and we have to start on the classroom addition soon. The good news is that John Morgan, a professional engineer at the College has agreed to help us in the building design, and later in the certification of plans, so that we can get a building permit. At a meeting on April 21, John suggested significant improvements to the layout and alerted us to a radical new building technique that may save us considerable money. Stay tuned. Soon (after our teaching responsibilities for the semester are finished), Ted and I will hit the phones scrounging for donations. We have yet to ‘test the waters’ this year but the more we can get donated, the better a building and the more equipment we can get. Our goal is still to break ground early in May and we should be on track. Also, Ted, Orla and I will be getting together to decide on what software, instruments and equipment to order from the PeGASus budget. Look for some neat ‘goodies’ to arrive in mid to late June. The Prince George Astronomical Society (PGAS) meets on the last Wednesday of every month (except December) at the College of New Caledonia (CNC) in the Physics Laboratory (Room 2- 223). Everyone is welcome to attend these meetings, and you can join the society for an annual fee of $20.00. Members of the PGAS have access to the observatory and equipment therein and receive this news letter on a monthly basis. For more information, contact Bob Nelson at 562-2131 or 563-6928 or write to The Prince George Astronomical Society, c/o 1393 Garvin St.,Prince George, B.C., V2M 3Z1. The Prince George Astronomical Society (PGAS) and the Fraser-Fort George Regional Museum are hosting an evening of star gazing on May 1 in celebration of the 20th anniversary of Astronomy Day. In recognition of this day, the museum is opening its doors to the public from 8:00 p.m. to midnight to give residents of Prince George the opportunity to enjoy an evening of stargazing with the PGAS. It will be an educational experience for all who attend. In addition to the telescope viewing, the PGAS will provide slide and video presentations and stimulating discussions. The event will proceed regardless of the weather. If it rains, the telescopes will be moved indoors to give the participants a chance to inspect the telescopes and talk to the owners. However, PLEASE pray for clear skies! If you plan to attend, bring binoculars, a spotting scope or a telescope if you have one. Astronomy Day. What a strange thing to celebrate. Astronomy Day has an odd ring to it, doesn’t it? I believe that this is because it originated in California. Twenty years ago several astronomy clubs in California initiated the idea of setting aside one day a year to officially celebrate the wonders of the night sky and to share these wonders with the public. They also wanted draw attention to themselves in order to attract new members into their society. The idea spread to other astronomy clubs across the continent, and now Astronomy day is being celebrated throughout Canada, United States, and Mexico. Astronomy Day is usually held in late April or early May while the Moon is in its first or last quarter phase. The reason for this is simply that the Moon gets in the way of observing the rest of the sky. Its not that the Moon is big, although it is pretty big compared with other objects in the sky such as the planets. The Moon gets in the way because it is bright and it makes all the other objects (nebulae, galaxies, and star clusters) difficult to see. Astronomy Day is also held in the early spring because it is not too cold. If it is too cold, the event will attract very few people, including the society members themselves. Then, why not hold it in the summer? If you celebrate Astronomy Day in the summer, the sun doesn’t set before 10 at night and it doesn’t get dark enough to see any nebulae, galaxies and star clusters before it is time to go to bed. That leaves the fall but in the fall the leaves fall and that gets too confusing for most of us, especially astronomers. On May 1, the moon will be past its first quarter by two days, so it is somewhat bright and the conditions will not be ideal. The moon will rise at about 5:30 p.m. on May 1, so it will be quite high in the sky by 8 o’clock in the evening. It will not set before 3:30 in the morning. We have our casino license in hand. The dates are May 13, 14 (that’s right, it’s only two nights this year) – Thursday and Friday. Hopefully, because one night is on a weekend, we may be able to raise as much as, or more than we have previously. We will be looking for some volunteers to staff the event – Bob Nelson will be phoning. people soon. On April 15, the PGAS finally received the long expected cheque for $25,000. The cheque was presented to Ted Biech and me at the Fraser-Fort George Regional Museum by our local MLA. Unfortunately, the press was not present at this momentous occasion so no pictures will appear in the Citizen, and no hand shaking will be seen on the local news. However, watch for the news release in the Citizen. After deliberating on the advantages of carrying out the PeGASus Project from Hawaii, we lent the money to the Bank of Montreal for safe keeping. The money will be used to carry out the PeGASus Project (see issue #34). Also watch for a feature story by Ken Bornsen, Citizen writer, sometime within the next few weeks. Ken interviewed Bob, Ted and me on April 20 and took pictures at the observatory (hopefully) on April 24. Let us cross our fingers. Prince George residents, along with the rest of Western Canada, will wake up on May 21 to a partial eclipse of the Sun. On May 21, the Sun will rise in Prince George at 5:06 and shortly thereafter the moon will begin to pass in front of the Sun taking its first bite out of the north-eastern limb at about 5:30. The eclipse will be at its maximum at 6:15 at which time the Sun is about 10 degrees above the horizon. The encounter is over by 7:10. At the maximum of the eclipse, about 40% of the Sun will be covered. This will not be enough for the casual observer to notice since their eyes are just barely open at this time anyway. If you want to observe the eclipse, then you must be VERY CAREFUL! NEVER LOOK DIRECTLY AT THE SUN! There are several techniques for viewing the eclipse. The method readily available to the typical person is to view the Sun through a piece of #14 welder’s glass. Such glass can purchased at a welding supplies store in Prince George (look in the yellow pages under ‘welding equipment and supplies’). There are other safe methods. If you are interested, give us a call at CNC and ask for Orla Aaquist or Bob Nelson. The best view is obtained if you observe the event through a solar filter fitted over the front end of a telescope. We have one at the college, and if anyone out there is interested, give me a call (Orla at 964-9626). If you get up before sunrise, have a look to the East at the bright ‘morning star’ Venus. On May 7 it shines its brightest at magnitude -4.5. It is, however, very close to the horizon. A little higher in the dawn sky is Saturn, now in the constellation Aquarius. On the morning of May 2, Saturn’s most distant large satellite (Iapetus) passes through the shadow of the planet’s ring system. Since the planet glows from reflected sunlight, the planet will disappear and reappear as it passes through the ring’s shadows. You will, of course, need a telescope to see this event since Iapetus is quite faint. When not in eclipse, it shines at magnitude 11. While it is eclipsed by the rings, it will get as faint as magnitude 13 or 14. It will completely disappear when it passes into the planet’s shadow. On the evening of May 11, Mars begins to traverse the Beehive open cluster in Cancer. The best view is on May 12. On May 13 planet leaves the confines of the cluster. . This entry was posted in 1993, Newsletters on April 17, 1993 by glen_h.